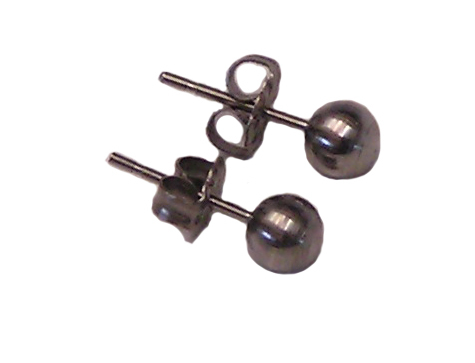 Dirinda designs beautiful, high quality titanium post earrings. All earrings are made in USA with medical grade titanium -- the best choice for those with allergic reactions to other metals. Dirinda's family business manufactures surgical implants for surgeons and dentists. She maintains the same strict quality control on her earrings as the surgical implants so the earrings are free from contaminants which are often the cause of allergic reactions. These earrings are made from surgical implant grade titanium (6AL4VELI) which is an alloy of 6% aluminum, 4% vanadium, 90% titanium with trace amounts of carbon, iron, oxygen, nitrogen, hydrogen and yttrium. The majority of people with metal allergies can wear these titanium alloy earrings. 6AL4VELI titanium alloy is the standard used for surgical and dental titanium implants. We have had a number of customers try these earrings before surgery to test to see if they will have a reaction to their implant. In each case to date, the customers have had no allergic reaction to this alloy. We recommend Dirinda's pure unalloyed titanium earrings over these alloy earrings, but for someone wanting to determine if they will have a reaction to an upcoming surgery with a titanium alloy implant, these are the ones to try.